It was lamenting the lack of a BS detector on the internet and how easily factoids can spread misinformation. Today’s little gem fits right in with that theme. The latest round of “Fish oil No Good for Heart Disease” studies was published this week by the prestigious New England Journal of Medicine (NEJM). The NEJM has long been considered the pinnacle of medical journals the world over. It is of course solely supported by Big Pharma advertising. Like the other big Journals, JAMA and the Archives of Internal Medicine, it maintains an “anti-supplement” stance, rarely publishing anything positive about anything that is not a Big Pharma drug. Since most allopathic doctors do not apply critical standards to what is published in these journals, the word of these journals is gospel. Not surprisingly the latest “Fish oil no Good For…” study will get a lot of air time and be virally spread on the internet with even less critical thinking and even more acceptance from the general populace. While I don’t normally bother with this because it has been coming and going for the past 10 years, I will admit there really seems to be an “anti-fish oil” campaign out there. The “Just eat fish” crowd has conveniently forgotten the issues of lead, mercury, arsenic, cadmium and plastic-derived xenoestrogens and toxins that are found in most oily fish in quantity. A few have even suggested that the “other oils” in fish, the stuff that is not EPA and DHA, have value. They sure do! They are valuable for calories! They make no contribution to the biochemical pathways and are otherwise non-essential, however. Getting back to the study aspect of things, I’ve said it a thousand times but I am forced to say it yet again. 3) Attempt to achieve the ratios of Omega 6 to Omega 3 that parallel the populations that have almost NO HEART DISEASE compared to ours. (It’s in the neighborhood of a 10 fold reduction). A) Dose? 1 gram. The study population was Italian, clearly a Waster diet based group. No, they were not on the “Mediterranean Diet”, a Health/Marketing concept created by Dean Ornish. They were clearly eating pasta! B) “Eligible patients were men and women with multiple cardiovascular risk factors or atherosclerotic vascular disease but not myocardial infarction.” In other words, they were ticking time bombs waiting to have their heart attacks. Their doctors already knew they had heart disease in many cases. C) What was the type of fish oil administered? It does not say; so it could easily have been a non-concentrated “natural cold pressed triglyceride” fish oil, which provides only 30% EPA and DHA. I need to try to find this out because it makes a huge difference. Why? Because they may have actually been only getting 300 mg of the active oils for cardiac disease prevention. You have heard me say the average Westerner needs at least 6 grams a day to fix their Omega 3 deficit and balance out their excess Omega 6’s. D) No levels were measured in these people – if they were, they would not have even scratched the surface with the dosages they chose to give people. E) The GISSI Prevenzione study also done in Italy over a decade ago using 2 to 3 grams a day of the highly concentrated ethyl ester form, like mine, (still an under dosage but better than this one) showed a far different 35% reduction in Cardiovascular Death. Two other things of note: The placebo was Olive oil, which is appropriate since Olive oil is Omega 6 dominant (21 to 1 Omega 6 to Omega 3). Next, they had to fiddle with their chosen end point: “At one year, after the event rate was found to be lower than anticipated, the primary end point was revised as time to death from cardiovascular causes or admission to the hospital for cardiovascular causes.” This kind of last minute post study fiddling makes the entire study questionable in my opinion! At least this was a study, however, and not a “meta analysis” – a computer generated file based on cherry picked data that can prove anything the authors want without spending more than a few dollars in computer time and many hours of doctoral candidate slave labor! So what should this study have been titled? Frankly, this kind of study, done in an era where the data already exists for both primary and secondary prevention with Omega 3’s, constitutes malpractice in my opinion. Also, I am not insensitive to the fact that my study title would probably not get many people to be interested, so here is another one which might intrigue the reader more – something you have to do for a sound bite society. I would call it the Educated Authors Trying to Suppress Healthy Interventions Trial. You may be aware it is customary in medicine to use the first letter of every capitalized letter in a trial to create an acronym for the trial’s name. I will leave you to that. I will also comment that acronym is pretty much my opinion of this study, which was designed to fail, adds nothing to our knowledge base and will undoubtedly contribute to the misinformation database out there in cyberland. Finally, I will say that if you actually do figure out the acronym based on what I told you above, you might anticipate a new Meta analysis that will tell you this practice is actually healthy for you! I doubt it will make it into the NEJM, however, unless there is a Big Pharma drug somehow involved. J Toxicol Environ Health A. 2007 Nov;70(22):1897-911. Heavy metals in Pacific cod (Gadus macrocephalus) from the Aleutians: location, age, size, and risk. Burger J, Gochfeld M, Shukla T, Jeitner C, Burke S, Donio M, Shukla S, Snigaroff R, Snigaroff D, Stamm T, Volz C.
“If a subsistence fisher from one of the Aleut villages ate one meal of cod per week for As, or one meal per day for Hg, they would exceed the U.S. EPA reference dose for As and Hg” As is Arsenic, HG is mercury! Thank you so much for pointing out the deficiencies in this study. I’ve been taking 3 grams of fish oil for several years, at the recommendation of a cardiologist (he takes 4 grams). I find it makes a significant difference in my blood pressure — something I found out when I decided I would quit taking it at one point. I had the radio on the other night and I heard a certain quack “Professor” railing on about how you shouldn’t eat fish oil because “we aren’t fish” and claiming that fish oil is causing all the skin cancer in Australians! The lack of scientific reasoning coming from this guy was incredible and yet he was given a platform and accorded respect as though he had real qualilfications! I’m so glad you are out there counteracting the nonsense. If people would learn to apply the criteria I spelled out in the blog, they would not believe the false information. But let’s face it, these days people want to stir the pot and get attention. There is a certain “DR” of electrical engineering whose initials are BP who has made a career out of acting like he knows what he’s talking about with Omega 3’s. Interesting enough, in Japan the doctors there use a version of fish oil to lower statin doses. Once they understand the Omega 6/3 imbalance is the culprit, they will no longer use statins. But that would threaten a 30+ billion dollar industry known as Big Pharma. The decline of Big Pharma would cripple the economy, so there you have it. Fin de notre surconsommation de poisson? I considered myself lucky to have a doctor that actually recommended I take fish oil. However, I was not told to take a high dose of it. I do anyway. I take 3-4 caplets 2-3 times a day and I truly believe that if not for this, I would be much worse off health-wise. I am sad to know that so much of the so-called scientific information out there is skewed to favor pharmceuticals and have so far been lucky enough to stay off of synthetic meds as a result of working with my doctor on lifestyle changes. I am thankful I have doctors willing to work this way instead of just throwing pills at me. Hi Dr. Dave, thanks for your personal response. I will check out that test as I do want to know what is optimal. 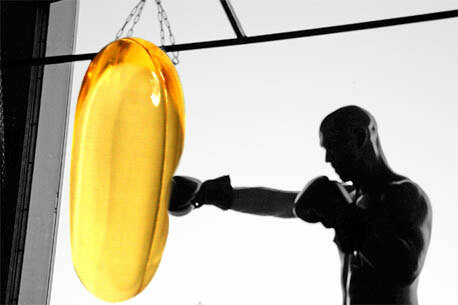 However, in the meantime, I did want to say that I can tell – my body tells me – when I do not take my fish oil regularly. Within a couple of days I realize I am more sluggish, tired, irritable… It was really an eye-opener for me when I realized that fish oil was the answer to feeling better! OK I get it I will start taking my fish oil but it will have to be the purest available I have more than my daily dose of mercury in my teeth. You will find no measurable mercury in our products.